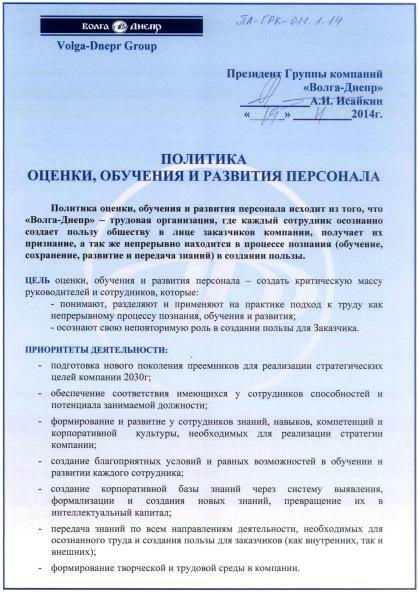 Personnel Assessment, Training and Development Policy - Корпоративный университет Группы компаний "Волга-Днепр"
Personnel Assessment, Training and Development Policy proceeds from the premise that ‘Volga-Dnepr’ is a labour organization, where every employee is conscious about his/her contribution to society represented by Customers, gains their recognition, is also in permanent cognitive process (learning, preserving, developing and sharing knowledge) and of benefit. who realize their unique role in creating benefit for Customers. to build up creative working environment in the company. assessment results help managers make decisions re a certain employee or a team, plan their further employment, training and development. in-house training is in favour if nurtured by the company expertise. educational programs are worked out in the context of tomorrow’s needs and with regard to expected functional tendencies. VD corporate university is in charge of training and assessment quality and organization, whereas executive managers and employees are responsible for efficient implementation of gained knowledge and mastered skills. only reliable and authentic methods are used for personnel assessment, training and development. studying process is organized on the principle of “70-20-10”, where 70% is on-the-job training, 20% is self-study, 10% is schooling (CU).